The Orions from planet in the Rigel system, for the most part, are Human-like beings. The dominant species of Orions have skin color ranging from ruggy, golden orange to the skin tones of Terran Caucasians. 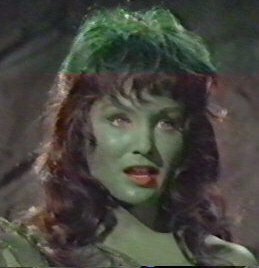 Some very Human-like females, however, are born with green skin. Said to be less intelligent of the dominant Orions (tough this may be more lack of educational opportunity than from genetics they behave in a semi-animalistic fashion. They usually have long, sharp claws and a greater physical dexterity than the dominant Orions. The Orion Colonies are allegdy neutral toward the Federation in external matters. They tend to encourage privateers (pirates), however, on an informal and unofficial basis, and Orion pirates and smugglers are sometimes encountered. Rigel is a system of four stars with thirteen planets, six of which I am populated. Rigel II and Rigel IV come identified often with the name of Rigelians Colonies. Rigel V is inhabited from a humanoid population very similar to Vulcans. Rigel VI and VII Rigel are two planets in troian orbit that represent a point of reference for the commercial exchanges of the Federation. Rigel VIII, called often also Orion, is inhabited by the aggressive humanoid native population from the yellow skin of about 5.4 billion of individuals. After have acquired the ability from terrestrial explorers of implement interstellar journeys, they have colonized planets and they have built the empire based on the piracy, as wrote above.